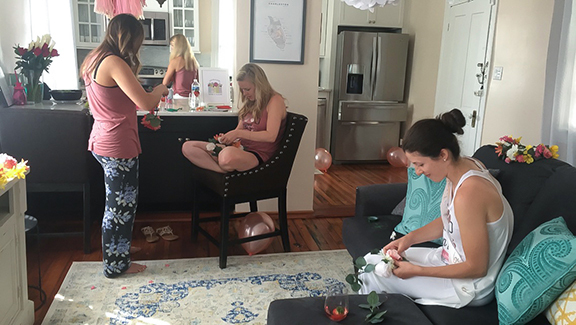 We started the weekend off with a little DIY flower crown partying right in downtown Charleston. This group of five chose silk flowers for their crowns, so I did my standard set up of laying out all of our flowers for everyone to choose their favorites! 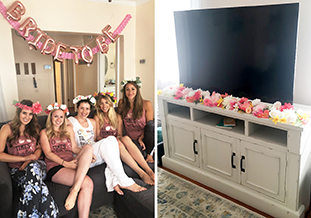 This entertainment center made the BEST space to lay out our florals! The cute bride taking a break to show off her crown! Ready to schedule your own DIY floral crown bar for a party, shower, girls night? Don’t let the summer pass you by, hurry up and schedule your next floral party!